1. Role play and problem solve situations to practice digital citizenship. 2. Identify and evaluate individual levels of digital citizenship. Got Media Smarts - What are the facts? What do we really know about the facts on teenage digital citizenship in the real world? What are our activities and how do they relate to digital citizenship? Look at the "Got Media Smarts" handout from Common Sense Media. Complete the quiz and compare your answers to a partner and discuss your similarities and differences. Gather as a group and briefly review each answer to the quiz as a class and review class answers. A MimioStudio Notebook format of the quiz is available in the Resources/Handouts. (The answers are cued with a sound to indicate correct or incorrect answers). We use technology every day for a variety of different things. Our use of technology has been rapidly changing in recent history as we have increased access to a variety of different technologies. How do these technologies influence our ability to be good digital citizens? What are some of the rules? How do I compare in my daily actions? A compass helps guide us in the right direction. We have to make choices every day when we use technology. The moral compass outlined by Mike Ribble helps us to make decisions on the challenges we are faced as digital citizens. The following activity is designed to help us reflect on our "Moral Compass". When dealing with digital media, each of us is guided by our Moral Compass. Our Moral Compass can be divided into 8 different levels. 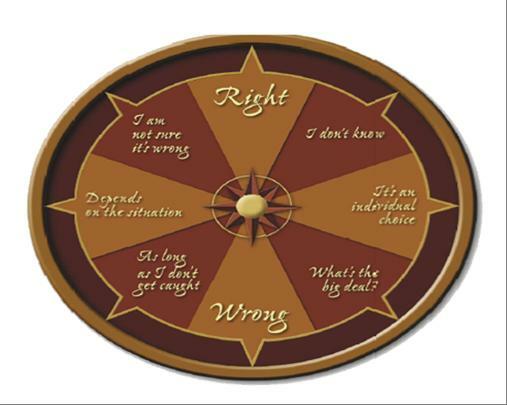 A presentation of the Moral Compass has been created with MimioStudio Notebook in the Resources. Right – These people understand the correct moral and legal use of technology. This is not always as straightforward as it sounds. I don’t know – These people are in the learning process. Digital citizenship skills must be learned before using technology. I am not sure if it is wrong – These people are in the learning process. When no digital citizenship training is provided from leaders, you may get poor advice. Wrong – These people understand the incorrect moral and legal use of technology. What’s the big deal? – These people feel that their personal choices in the use of technology should not be a big deal for others since their choices about the use of digital media do not affect others. These people have difficulty realizing that their choices often do affect others. As long as I don’t get caught – These people believe that technology is there to be used and everything will be fine as long as you don’t get caught. These people need to understand that their use of technology can affect others around them. It’s an individual choice – These people believe that technology use is a right and not a privilege and they do not want others to tell them how to use their technology. Depends on the situation – These people realize that some activities are appropriate in one situation or setting but may not be appropriate in others. In groups of 2 or 3, review the ten scenarios outlined in the handout and identify the direction the character is taking according to the moral compass from the “Moral Compass Student Handout". Is the student using technology appropriately? What consequences might occur if there is inappropriate use? Are there any better solutions that you could suggest? Your group will also be asked to identify two additional scenarios to share with the class. Be prepared to discuss how each of these situations relate to the moral compass. As a class, discuss each situation. Remember to also reference the six directions on the compass and the consequences for the different directions in each situation. Remember the “Digital Citizen” Guidelines for Regina Catholic Schools. As a class or individual, examine each area on the digital citizen infographic and evaluate your moral compass for each area. Identify class or personal goals and methods for improving digital citizenship based on the Regina Catholic Schools Digital Citizen Guideline Infographic. You can also self-evaluate your own understanding of the digital citizenship using the rubric.